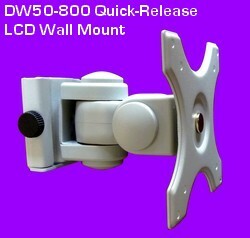 A quick-release LCD monitor mount is a efficient way to to affix your LCD monitor to a wall and retrieve it in seconds. Simply attach your LCD monitor to the 100 x 100 and 75 x 75 mm. VESA bracket plate using the provided screws. Secondly, screw the wall bracket part of the DW50-800 to the wall. Finally slide (hang) the LCD monitor onto the wall bracket and secure it using the screw-knob. 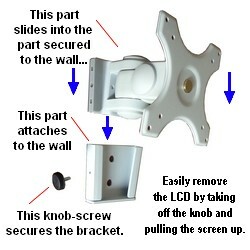 This system allows retrieving the LCD panel easily in a few seconds, as it actually hangs onto the wall bracket. If you wish to leave the LCD screen on instead of retrieving it and you believe security might be an issue, for that ocassion, simply replace the knob with a screw or security screw of the same thread and length. The image above shows that you can adjust the "torque" of each articulation, meaning that you can make each movement stiffer or looser, simply by applying the provided wrench on the torque nuts. Both the swivel and tilt can be adjusted. This LCD Wall mount even rotates, for landscape or portrait use. The above picture shows a side view and a top view, revealing that the tilt and swivel is only limited by the size of the monitor used, since it can be adjusted until one of the monitor's sides meets the wall. We ship all orders received before 03:00 PM EST the same day. Expedited shipping options available upon request. See more Wall LCD brackets and LCD monitor mounts below. Simply click on any image for more information.